You are here: Home / Automation / An update on how to retrieve useful information from a vSphere login? There was an internal Socialcast question today in which the answer could be found in my how to identify the origin of a vSphere login article. After responding to the question, I had realized that I wrote that article almost 6 years ago and what is even more crazy is that it is still very applicable today. The article explains how you can identify a vSphere login by enabling the "trivial" logging option in vCenter Server (extremely verbose, so please use with caution). Once enabled, you can go through the vpxd.log file and find things about a user login such as the the IP Address of the client as well as the type of vSphere interface they had used to login to whether that is using the vSphere C# Client or PowerCLI for example. Although this extracted information can be very useful, the process to retrieve this is not very ideal, especially having to increase your vCenter Server logging verbosity to the extreme which can force other more critical log events to roll over. With the information above, not only can you tell who is logging in but also where (IP Address) and most importantly how (User Agent) they are logging in. One thing to be aware of is that the User Agent is not always populated and even if it is, it may not provide you with enough information on the specific interface a given user is logging in from. For example, it looks like a script written using the vSphere SDK for Python does not actually set the User Agent, so it is empty. Finally, saving the best for last. 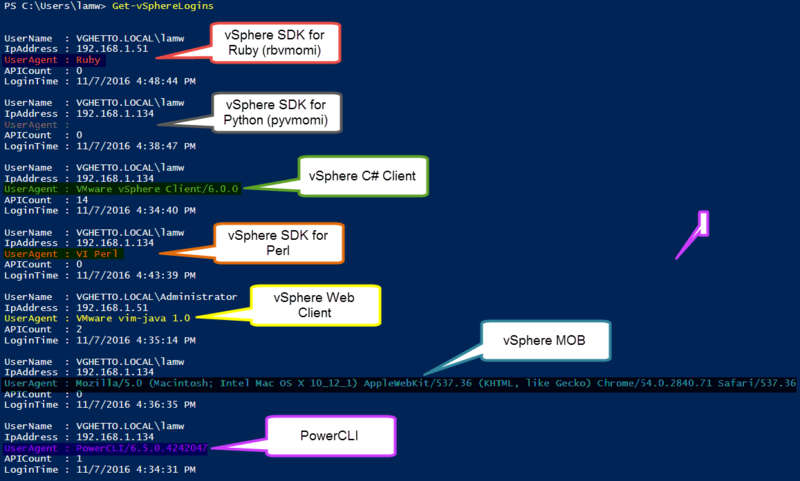 The VMware Engineer(s) not only added these new properties into the vSphere API, but they have also made them readily available using the vSphere Web Client. To view all the session information, navigate to your vCenter Server instance and under Manage->Sessions you can get the exact same view as using the vSphere API. By default, the IP Address, User Agent & API Invocations are hidden by default. You just need to right click on the table header and add those additional field as shown in the screenshot below. 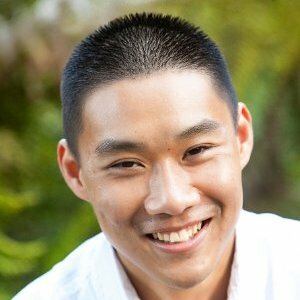 Longer term, it would be great to see that each of the "official" VMware CLI/SDKs as well as other interfaces can uniquely identify themselves with a well defined string. This not only helps with understanding the types of tools customers are using but also helps with any types of internal audits customers may require. If you think this would be useful to have, please feel free to leave a comment or any other things you feel would be useful to include. Great article, I have really enjoyed your article . You show how to retrieve useful information from a vSphere login.I was little bit confused about how I can identify a vSphere login and now I completely understood that we can identify a vSphere login by enabling the “trivial” logging option in vCenter Server . It is really helpful. I have done by the help of your article. Thanks for sharing. The way you explained each and everything is really great. Thanks once again . I needed this for a vRO workflow today, to distinguish manual VM registrations from converted ones. …and don’t get irritated by the version number. I would like to ask if is possible to get historical login data via powershell ?